�����Dealers are back for another Long Beach Expo, only this time the metals have begun the week on a slightly stronger note. Gold has climbed back to $1,194 per ounce, with Silver at $16.90 and Platinum higher at $1,112. It would certainly benefit the Expo if the metals show strength throughout the week. Original one ounce Proof Gold Eagles are wholesaling at $1,335 and Proof Silver Eagles are $46 in the OGP. Platinum one ounce Proof $100 coins are trading at $1,245. Ninety percent bags are $12,655 and circulated Silver Dollars are $24,825 per bag of one thousand. �����Heritage Auctions is a mainstay at the Long Beach Expo and this auction is sure to please dealers and collectors with a variety of rarities. One of the many highlights of this sale will be the 1792 Half Disme in PCGS MS64. This is one of just eight coins certified by PCGS in MS64, although there are another six reported at NGC. 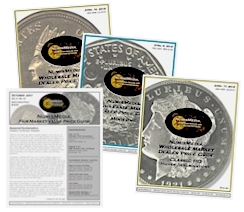 There are eight coins combined grading higher with only one PCGS MS68. �����Another extreme rarity in this sale is a 1793 Wreath Cent with Vine and Bars; this is a PCGS MS65 Brown and the current FMV is $237,500. 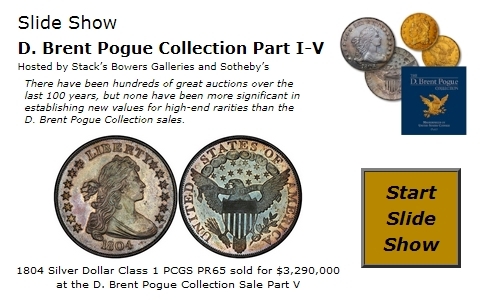 There are five coins total in higher grades with the highly regarded PCGS MS69 the finest known. Below are some other potential highlights from this latest Heritage Auction. 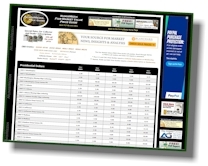 �����Recent auctions created a mass of increases in the most recent HD Wholesale Market Dealer Price Guide. Beginning with Early Halves, you will find numerous advances for many of the better dates in most grades above AU. For example, the 1794 Flowing Hair Half Dollar in MS64 jumped to $500,000 Market, while the 1795 in the same grade soared to $175,000. The 1796 16 Stars climbed to $475,000 in MS65 and $750,000 in MS66. Also advancing this week were the 1806 and 1807 in MS66, now at Market of $93,500 and $92,500, respectively.